For decades Donald Trump, his parents and siblings cheated on taxes in numerous ways, The New York Times reported in an extraordinarily thorough and well documented expose published on Tuesday, Oct. 2. 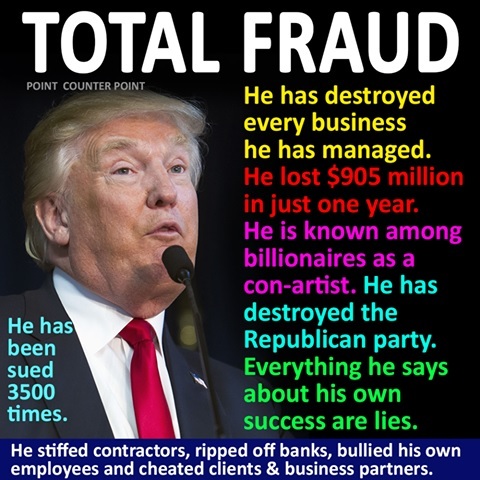 In a meticulously reported, 14,000-word article, the paper also demolishes Donald’s claims that he is a self-made billionaire who started out with a $1 million loan from his father Fred who Donald paid back with interest. Donald got at least $413 million, in today’s money, from his father and never fully repaid his loans. The Times obtained access to more than 100,000 pages of Trump documents including “bank statements, financial audits, accounting ledgers, cash disbursement reports, invoices, and canceled checks. Most notably, the documents include more than 200 tax returns from Fred Trump, his companies and various Trump partnerships and trusts.” It did not get any of the president’s personal tax returns. The arcane and difficult subjects of both tax and accounting are masterfully explained in plain English. As the paper’s former tax reporter, and the journalist who has covered Trump the longest, I’m in a solid position to judge the depth and quality of this work. It is masterful. The Times expose shows in vivid detail how egregious the tax cheating was – not chiseling here and there, but gigantic lies to escape lawful burdens. The Times expose is exactly what it purports to be: “unprecedented in scope and precision.” And it shows in vivid detail how egregious the tax cheating was – not chiseling here and there, but gigantic lies to escape lawful burdens. The piece goes far beyond the two civil income tax fraud trials Trump lost, news I broke in The Daily Beast two years ago. State tax authorities said Tuesday night they were looking into the facts reported by The Times. Since June 15, DCReport has been calling for a criminal investigation of Trump’s taxes. After our readers flooded N.Y. Gov. Andrew Cuomo with phone calls he signaled approval of such an inquiry. The documents and interviews with former family retainers show the Trumps lied again and again on documents to enrich themselves and underpay the government. In deals to transfer wealth from Fred Trump to his children, transfers subject to a 55% gift tax, the Trumps drastically undervalued properties. When more than a thousand apartment units in eight buildings were transferred from Fred Trump to his children decades ago no taxes were paid on seven of the buildings and a token sum on the eighth building. Donald Trump has always claimed his fortune grew from a single $1 million loan from his father that was paid back with interest. The documents show Donald received loans and gifts worth in today’s money $413 million and failed to pay back many loans. Among the loans was one I reported on in 1990 – a scheme to evade New Jersey casino rules on capital invested in gambling halls. Fred Trump’s lawyer deposited $3.5 million cash to pay for gambling chips, but left without playing. The cash infusion saved Trump from missing a payment to Trump Castle bondholders. Casino regulators fined Donald $30,000, a slap on the wrist. In 1995, the elder Trump used a tax avoidance device known as a GRAT – grantor-retained annuity trust – to pass almost all of his wealth to the children while paying no gift taxes. For the tax dodge to work, the Fred and his wife only had to live for two years, which they did. Over the years, the paper reported, with Donald’s share of revenue from the family grew, which meant his three surviving siblings got less. The Trumps used invoicing schemes to reduce taxes and transfer wealth. On 78 refrigerator-stove combinations bought for rental apartments at a cost of $642 each, financial records inflated the cost by $300 through a company the family-controlled, documents obtained by The Times showed. That allowed the Trumps to take 46% more in tax deductions than the law allows. This was not a one-off, either. The newspaper said it found 295 separate schemes that made money flow to the children using invoicing schemes. That many schemes suggest that, as I have said many times, the Trump family is a white-collar criminal enterprise with the added benefit of one Donald’s siblings being a sitting federal judge. The Trumps cheated poor tenants in rent-controlled apartment by fooling housing authorities. Robert Trump, Donald’s younger brother, also testified under oath to inflating expenses on rent-controlled apartments, which means the Trumps cheated the poor to add to their fortunes. “The higher the markup would be, the higher the rent that might be charged,” Robert testified. Donald Trump manipulated the prices of stocks, including Time Inc., the magazine publisher, claiming he bought big stakes in the firm. In fact, his father bought shares, selling them two weeks later for a tidy profit after Trump planted his fake news with Don Dorfman, a financial columnist. There is no indication that Dorfman had any role in the scheme other than reporting what Donald said. Keep in mind that there is not a scintilla of verifiable evidence that Trump is or ever was worth a billion dollars. While candidate Trump claimed to worth more than $10 billion, as president he filed a financial statement showing a net worth of just $1.4 billion. That document used highly inflated values for many assets. Also, because of loopholes on reporting requirements that Trump himself cited in 2015, it does not list all of the debts he owes. There are no circumstances under which it is good for America to have a tax cheat in the White House or on the federal bench.